According to family legend, after reading an English version of a medieval Welsh poem, Joseph Clancy decided he could do it better, so he taught himself Welsh, especially poetry. His final book, the 2016 Poems of Dafydd ap Gwilym came out just before he died. He would have been 90 on March 8th. Born 8 March 1928 in New York to Joseph Clancy, a typesetter, and Maude, a hotel supervisor, Joseph Patrick Clancy took his Ph.D. from Fordham University in the Bronx to teach at Marymount Manhattan College. 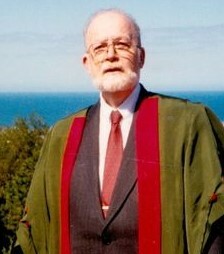 After finishing his academic career there as Emeritus Professor of English Literature and Theatre Arts, he moved to Wales in 1990 with his wife Gerrie and made Aberystwyth his new home. From a “poor boy bursting with language,” he later became a Fellow of the English Language Section of Yr Academi Gymreig and Honorary Fellow of Aberystwyth University, and received an Honorary Doctorate from the University of Wales. Curiously, as his Telegraph obituary put it, “He delighted in hearing it used as a living language – he could not speak it.” But he helped others sing from the page. Clancy translated works from the 6th century Old Welsh to modern writers such as Gwyn Thomas and Bobi Jones. His first major Welsh book, Medieval Welsh Lyrics (1965), impressed some Welsh scholars, who were “not the easiest to please when their literature is turned into ‘the thin language.’” Clancy followed with The Earliest Welsh Poetry (1970), including Y Gododdin. Twentieth Century Welsh Poems (1982) focused on contemporary Welsh literature. He also tackled prose works, such as the short story collection The World of Kate Roberts (1991), and dramatic ones, The Plays of Saunders Lewis (2002). A poet in his own right, he published four collections of his work – The Significance of Flesh: Poems 1950-1983 (1984) Here & There (1994), Ordinary Time (1999), and Passing Through (2008). He also wrote essays, Other Words: Essays on Poetry and Translation (1999); short stories (as P.G. Thomas), The Retired Life (1997); and non-fiction – Pendragon: King Arthur and His Britain (1971); and co-authored a mystery novel with his wife Gertrude Clancy – Death is a Pilgrim: A Canterbury Tale (1993). Joseph Clancy died peacefully just short of his 89th birthday on 27 February 2017 in Glasgow, Scotland. He is survived by his eight children, fifteen grandchildren and ten great-grandchildren.